Why do we use launchers? Some people want to customize their phone menu. Some want to try out cool themes. Some want to make their phones inaccessible by other persons. Now, we also have different wants when it comes to picking the best launchers for Android devices, What are these wants? Basically, we check for customization, design, and speed. Mr, A, might look for the fastest android launcher. Miss, C, Would want an action launcher for android. I’ll quickly tell you about my list of top android launchers, and I am pretty sure that you will find the right launcher for your Android device. So who is going to take the top spot? This hybrid launcher is highly customizable, and I am not bluffing. Nova gives you the opportunity to edit your Android device till you probably get tired of customizing. This unique launcher replaces your current home screen to one that you can customize to your taste. Fast: The nova launcher is known to be highly optimized to help you perform specific edits at a crazily outstanding pace. If you have been looking for a fast launcher? Nova is the guy for the business. Colour Controls: You can easily control colors for labels, backgrounds, and folders with Nova. Customize App Drawer: Nova lets you add awesome custom effects to your app drawer which involve horizontal and vertical scrolling. Themes: Download and install custom themes from an archive of thousands of themes. Infinite Scroll: Access tabs/pages from your drawer with ease with the infinite scroll feature. Backup/Restore: Backup and restore your saved design/layout with ease. This is yet another fantastic launcher, it is loved by people for its simplicity. The Google now also boasts of cool modification options that will leave your home screen looking sweet and lovely. And guess what? it comes with built-in ‘Google app’ for smooth mobile user experience. Fast; This is not a drill, I repeat, this is not a drill, the Google Now is at the top of the chain when it comes to speed. Google Now launcher also gives you Quick access to search from every home screen. Nicely designed A-Z list for your apps and games. The Action Launcher is not widely known by Android users but trust me when I say it is worthy to be on this list. Are you looking for an Android launcher with a unique layout and display? Action launcher is the answer. With cool customization options, you’ll have your phone looking like a hybrid zone. Quick-bar option lets you customize your home screen by adding shortcuts, games, and applications of your choice. Quick-theme: Customize your home screen with the colors from your wallpaper. Import settings from other launchers such as Apex, Nova, Google now launcher, And the stock android launcher. This is one of the oldest Android launchers of all time, Apex launcher has been around for a while and it has been ”slaying” all the while. According to the developers of this android launcher; they say it is a launcher that gives your Android device a complete makeover. Super Fast: Yup, it is also fast, and not just fast but super fast, even after customizations. Ability to hide apps from the drawer. Cool home screen gestures (pinch, double tap, swipe up/down). Get cool skins and icon packs. Looking for a crazy launcher with awesome customizations? Then you just found your missing rib!!!! Yahoo Aviate launcher is literally a demi-god when it comes to making your device to have a new look, some say the Aviate launcher feels like a personal assistant. This app also intelligently sorts out the apps you use the most. So what makes Yahoo Aviate Launcher unique? It is clutter free and quite easy to navigate. It organizes your frequently used apps. Swipe up to see your favorite contacts instead of searching on your contacts list. The Yahoo aviate launcher comes packed with a search box that lets you easily search the web. That’s not all, this launcher offers more cool features for you. The launcher 8 is sleek, unique and quite easy to setup, it’s main aim is to make your phone look like a windows phone. I thought…….. Hey! It’s sleek and should be among the top android launchers. You can customize titles to your taste. It has a nice search bar that gives you easy access to search the web. Fantastic wallpapers to choose from. Create folders with the ability to lock and hide. This Android Launcher is widely known and because of its amazing features, it is worthy of being in our list of top android launchers. 3D Widgets, themes, and icon, all in 3D. Different gestures on your home screen and app drawer. So there you have it, these 7 top android launchers that will leave your Android device looking like WOW!!! In terms of speed, design or customizations, these 7 top android launchers will make you happy. 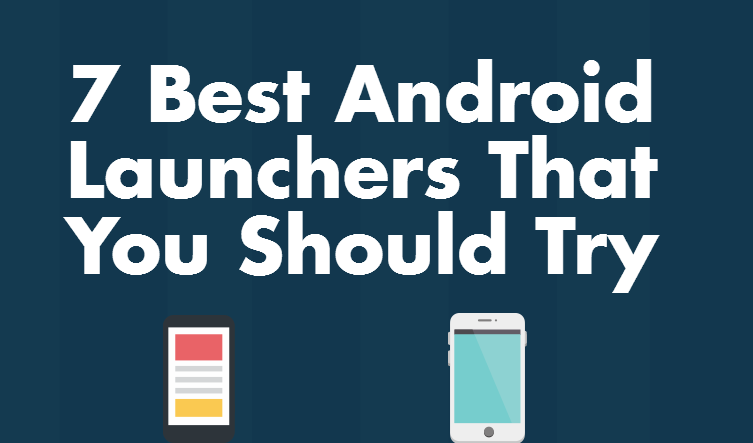 Have you tried any of these Android Launchers before? What are your thoughts about them? Feel free to drop a comment and also use our share buttons to share this lovely article.